In 1998 Compaq announced the 21364, which was suppose to be taped out (the hardware layout for the masks) in 1999. This ended up being delayed until 2001. 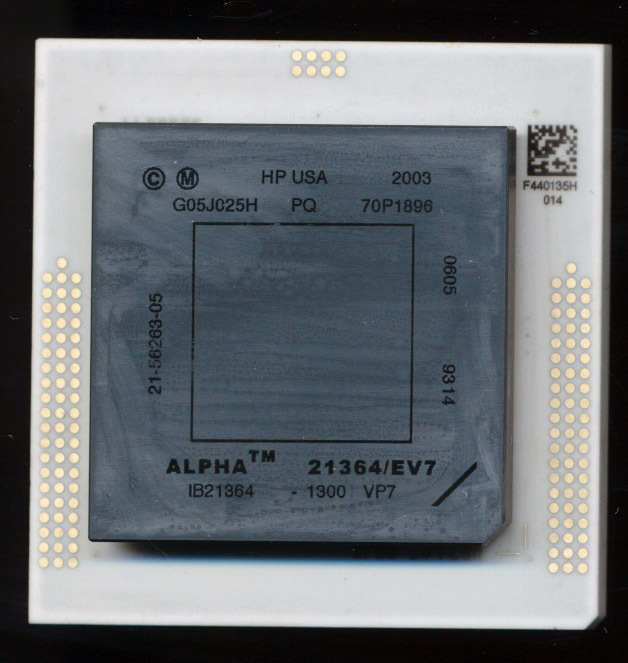 The 21364 was finally released in January 2002, fully 6 months AFTER the release of Intel and HP’s Itanium Processor. 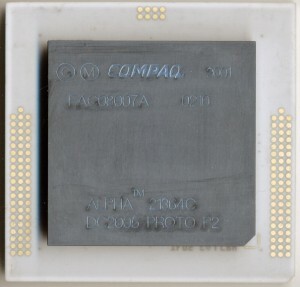 In May of 2002 Compaq merged with HP, sealing the end of the Alpha. Devlopment and production continued, albeit at a very slow pace. 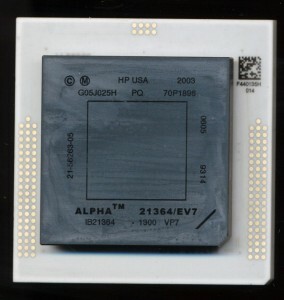 The 21364 was not sold as a processor alone (as had previous Alphas) but was restricted to being sold in a very few systems. The 21364 itself was not an entirely new processor. It retained the 21264 core, at speeds of 1.2-1.3GHz but moved the 1.75MB secondary cache back on die. The Cache itself took 113.75 million of the 21364s 152 million transistors and was fab’d on IBM’s 0.18u process. The 21364 also included dual on die RDRAM memory controllers as well as on die networking to support multi-processing. HP was to release an enhanced 21364A in 2004 but this was canceled citing ‘performance issues.’ The reality of the situation was HP did not want to support two architectures. They were much too heavily invested in Itanium to continue supporting the Alpha architecture. The Alpha was finally discontinued in 2007, following 15 years of production. Sadly an end due less to performance and technical reasons, then to corporate politics.